I had an army I was comfortable with, a mix of shooting and unsubtle head-kicking units. Lt Devereaux, with the single piece of wargear allowed by the league rules (power axe) would accompany an 8-strong tactical squad with a flamer and veteran sergeant. A mini-Devi squad, five marines with two missile launchers, plus a squadron of three bikes loaded with meltagun and flamer, would provide the serious firepower. Finally my scout squad, five with pistol/ccw and a veteran sergeant, would help out in assault. My opponent had pretty much what I was expecting - I notice you don't tend to get much variety in 500 point guard armies. 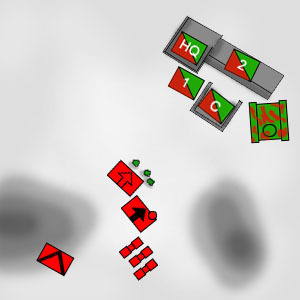 A command HQ, including an officer with a boltgun, medic and lascannon. A command section with a mortar and plasma rifle, two infantry squads (heavy bolter, flamer, and autocannon, meltagun) and an armoured fist squad with a grenade launcher. The mission (as usual) was Cleanse. Deployment was easy, for the guard, their table quarter containing a battle bunker and all. The Chimera sat on the table edge, obviously ready to take advantage of the cover offered by trees and an ice mountain. The Command HQ went on the main roof of the bunker, one of the infantry squads (#1) lined up on the (unshielded) roof to one side. The other infantry squad (#2) deployed in front of the bunker, and the command section (with its mortar) took up residence in the little fortified gun pit. In front of them was a nice open space, with only a handful of barrels for cover. I've heard of the guard's tendency to shoot the crap out of anything (even if it's armoured), so I wanted to spend as little time as possible messing around. The scouts went up behind the barrels, as close as possible (18"), the tactical squad and Devereaux out to their side, in the open due to lack of available cover anywhere nearby. The bikes sat on the other side of the tactical squad, and the Devis took up position behind an ice spire, poking their heads out just enough to shoot. The Guard got first turn, and only the Chimera moved, taking its full 12" to be right behind the ice mountain ready to flank me, while I hadn't a hope of getting LOS to it. Oh well, deal with it later. Everything else opened up on my tactical squad, but some dreadful dice rolls resulted, eventually, in one marine falling (plasma rifle got him). End of turn. I wasn't happy about being shot at, even though almost everything failed to hit, wound or get through my armour. The scouts, tactical squad and bikes moved forward, straight towards the firebase, firing as they went. Two frag missiles from the Devis thinned the ranks of infantry #2, and the scouts' bolt pistol did further damage. The tactical squad and bikes reduced the command section to one worried-looking lieutenant. The Guard turn began with the Chimera locating a rock beneath the edge of the ice mountain, by ripping its track out trying to drive over it. The embarrased squad disembarked and fired a krak grenade into the Devi squad, taking out one of the bolter marines. Infantry #1 took a difficult terrain test to scramble down from the roof of the firebase, managing to move far enough to occupy the gun pit vacated by the dead command section. The rest of the Guard pursued their usual policy, firing point-blank into the advancing marines. One scout fell to infantry #2's flamer, but otherwise the firing was ineffectual, power armour again proving itself worthwhile. The bikes did a quick U-turn and headed back towards the immobilised Chimera, and would have zapped it with with their meltagun had the Devis not got in first, the one missile launcher with LOS proving to be enough (rolled a 6 for glancing hit damage). Instead the bikes fired their twin bolters point-blank, achieving the impressive feat of six kills (alright, so the flamer helped). The scouts advanced on infantry #2, taking a moment to gun down the morose-looking lieutenant to one side of them. The tactical squad advanced on the gun pit and fired into infantry #1, but the 4+ cover save protected all but a couple of them from the combined bolters and flamer. The scouts assaulted infantry #2, reducing them to a single desperate sergeant, while the tactical squad wasn't quite in range of infantry #1. The bikes managed four kills in their assault, finishing the remnants of the most unlucky armoured fist squad in Imperial history. The HQ, still on top of the firebase, fired into the tactical squad, managing a couple of casualties as 3+ deserted me for a moment. The lone survivor of infantry #2 vanished under the scouts' attacks, and the scouts advanced 5" towards infantry #1. The bikes did another U-turn and got close enough to the firebase to fire, on long range, into the HQ atop. The scouts stood still and did likewise, using their rapid-fire pistols, while the tactical squad advanced and flamed infantry #1. Adding in the two frag missiles from the Devi squad, and taking account of the 4+ cover between all of them and the HQ, two of the five fell. The tactical squad assaulted the mostly-intact infantry #1, taking no wounds from the guardsmen (who struck first because of the gun pit's cover) and returning a couple of casualties. The HQ's bolter and lascannon fired, but (again) missed, while infantry #1 did its best to take down a marine after the tactical squad had a momentary lapse and forgot how to fight. Luckily power armour avoided the embarrasment of losing an assault to guardsmen. The scouts stood still and rapid fired into the HQ, the bikes got within 12" and did likewise, and the Devis put in another couple of frag missiles. Basically, the HQ died. In the assault phase Devereaux left nothing much for the tactical squad to do, taking down the majority of infantry #1 by herself. Game over, 2 quarters to nil.